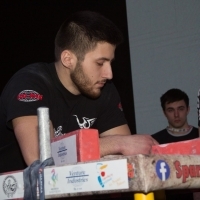 Tell, please, how did you come to armwrestling? – Michelle Opperman, Terence Opperman's sister, introduced me to armwrestling at the age of 16. I did armwrestling as per occasion due to other sport activities and job commitments. I had very little time to practice or participate, but I started again this year with Terrance Opperman as my mentor & coach. I have always had a passion for any sport. I chose armwrestling again with the inspiration of Terence Opperman whom I appreciate for all my support and guidance. How many women do armwrestling in South Africa? – We do have a lot of competing women champs in South Africa. We always try to encourage more women to participate in this amazing sport. What achievements do you have already? Will you pull at Zloty Tur? – Yes, I will pull at Zloty Tur this year. It's my first international armwrestling competition that I will attend to, but hope for many more to come. There is always room for improvement, but with the guidance of Terence I'm sure I can go from strength to strength. I don't expect any results at this stage in time. I'm very nervous and very excited to see what Zloty is all about. – To be honest with you, I don't know who I'll be facing and pulling at the table.